What intrigued me about 7TV when I saw it at Salute (apart from the fantastic inside of the volcanic lair model) was that it wasn’t an RPG (good!) and that it had generic stats for different models which were customisable to represent anyone from Batman to Indiana Jones. 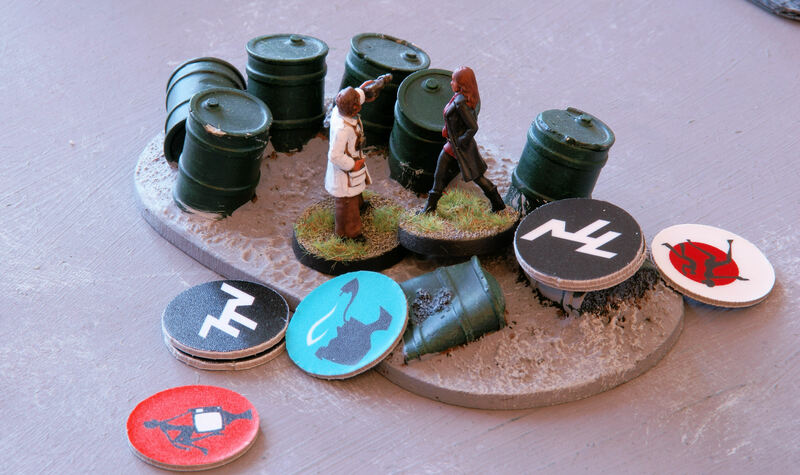 So I’m thinking that it would be something to use the Heroclix figures in the loft for, as well as another use for my WW2 Germans trying to stop the Allied archaeologists winning the war by digging up stuff. My son is a big Dr Who fan, so this was the our starting point – he provided the stats for the Professor (who is really an alien), his Plucky Assistant and their friend RAF Man. To get the ball rolling, I quickly did stats for a Mad Scientist and his security detail who are guarding something “really important” in an industrial complex, and our heroes have to find it. The industrial complex “Project Gamma” (how original) was the usual mess of pipefarms and skips to allow our heroes to slip undetected to the lab in the middle and steal the “secret” from under the noses of some inept guards. There are a couple of steps to carry out before the game can start. Firstly, the Event cards are dealt (4 to each player recommended) which add a bit of chaos to the game – I must confess I forgot about them when I was playing because I was too busy looking up the rules! The second pre-game phase is the Think Tank phase where you get to pick your gadgets. Each star gets a dice, then 1D6+2 is added for the Gadget knowledge attribute (points for which can only be used by the figure who generated the dice) and finally 1 D6 for each Boffin level. This gave the Good side 5D6+2 against the Bad side’s 2D6 (2 levels of Boffin, but no star – only a co-star). 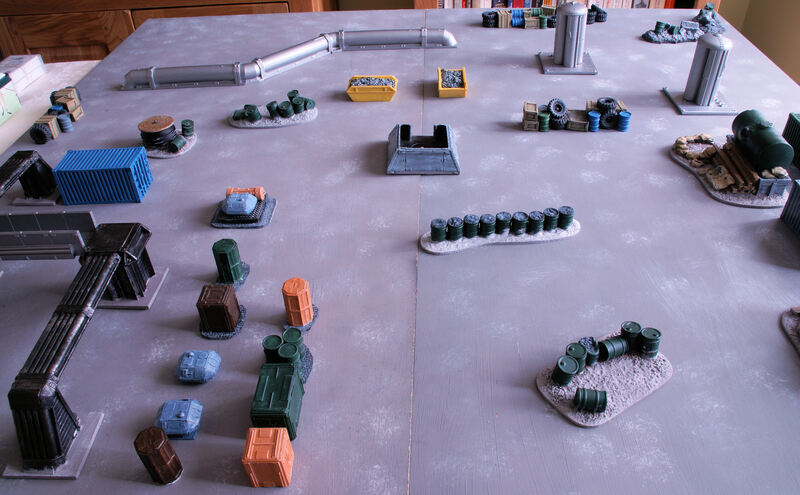 Good rolled 22 points on their dice, with 5 for the exclusive use of the Professor – he got a Sonic Stunner @ 12 points, Plucky Assistant got Sleep Spray @ 6 points and RAF Man got a Bullet-proof Vest @ 4 points. Evil got a Lazer Scope and a Homing Device for 8 points. As Good gets priority automatically on turn 1, there were no Audience Appreciation tokens up for grabs. The number of figures which can be activated in a phase is half the side’s models rounded up (but not captured or stunned figures). Each activated figure gets 2 actions each – one star or co-star gets a Heroic Action during each turn, which gives a +2 bonus to hit, to wound/damage or on stats tests. The Good plan was for RAF Man to take up position on the pipe farm bridge, where he could cover the advance of the Professor and Plucky Assistant to the laboratory – as he had the Eagle Eye attribute, he could add 6″ to his range, making his Military Pistol an 18″ strength 4 weapon. RAF Man and the Professor are activated – RAF Man moves to the foot of the pipe farm stairs for 1 action, then climbs the stairs for his 2nd action (climbing between 2-4″ is an activation with no horizontal movement). The Professor activates and because he has a Leader(1) attribute he can also activate Plucky Assistant, and they both use 2 movement actions to run 12″ through the assorted crates. 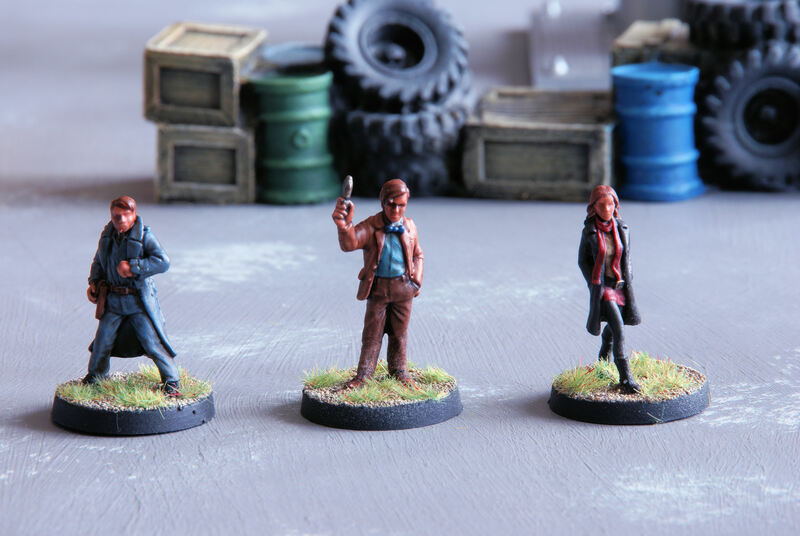 Evil has 6 figures, so gets to activate 3 – the dog handler, Mad Scientist and a rifle-armed security guard. The dog handler can also activate his dog, so moves 6″ but stays within 6″ so the dog can leap-frog him by moving twice, but stays within 6″ and in command. The Mad Scientist tries to figure out how to work his Alien Pistol to fire it at the Professor 15″ away. With intellegence 6, he can do this with anything but a 1 on his 1st roll, or by rolling a 6 on his 2nd attempt – guess what – he rolled a 1, followed by a 4, so fails (I suppose he could have used 1 of his 3 luck tokens to re-roll the 1st dice, but as the luck tokens have to last the entire game, I decided not to). The activated rifle-armed security guard takes aim for an action (adds +2 to the to hit roll) at the Professor – needing a basic 4+ to hit, he has -1 for cover & -1 for range but +2 for aiming means that a 4 rolled is a hit. The rifle is strength 3 against the Professor’s defence of 4, which means that a 5 is needed to would, but the Professor’s Invunerable(1) attribute adds 1 to his defense, so a 6 is needed to wound – a 2 is rolled, so no wound. On turn 2, Evil get priority with a difference of 3 – this means that the Evil side gets 2 Audience Appreciation tokens while the Good side gets 1. 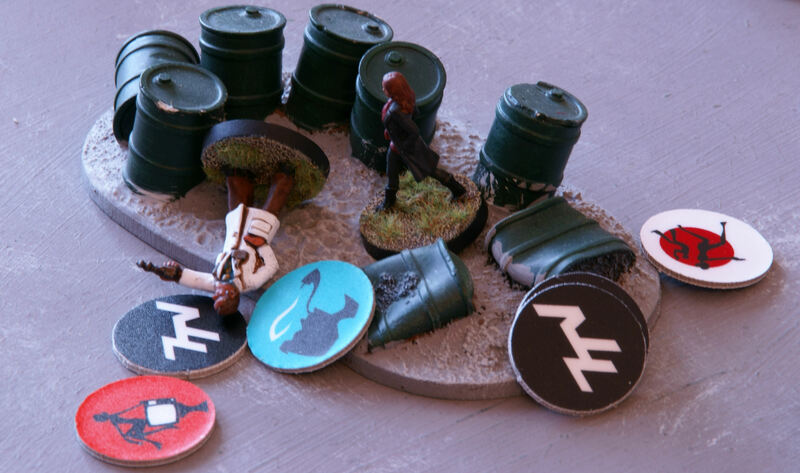 These tokens can be used to amend a dice roll by +1 or -1 (any number on a single roll), or 2 can be used to activate an extra figure – both these effects can only be used in your own turn, not your opponent’s. Evil activates the same 3 figures. 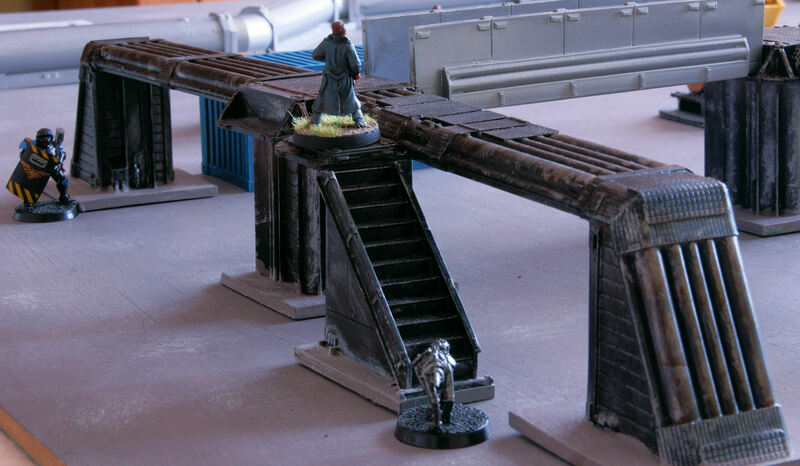 The dog handler activates the dog, then moves 6″ for 1 action and fires at RAF Man at the top of the pipe platform stairs. From 4+ to hit, this is modified to 5+ for being over half range, and a 5 is rolled. This is a strength 3 attack against defence 4, so needs a 5 to wound. 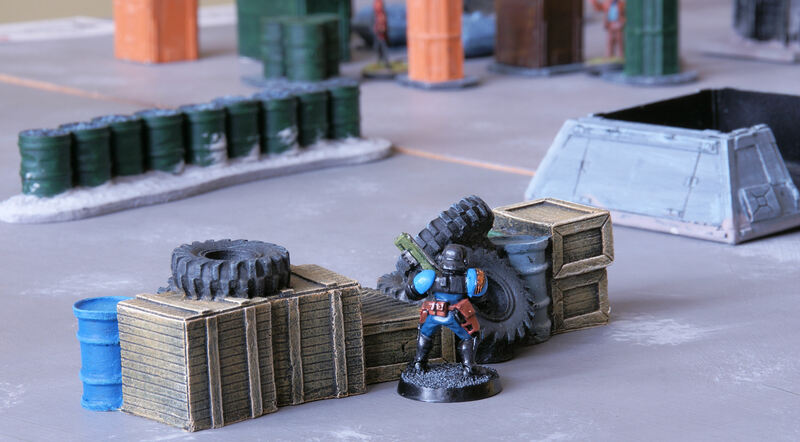 A 6 comes up, and RAF Man decides to play a luck token (his only one) to re-roll the wound roll rather than rely on his 5+ save from the bullet-proof vest – the re-roll come up a 1, so his luck holds. The dog bounds to the foot of the stairs ready to run up and attack RAF Man from behind next turn. The Mad Scientist tries to figure out how to use the Alien Pistol again and succeeds. For his 2nd action, he fires at the Professor – it is 3+ to hit and should be -1 for over half range, but as the pistol is a “lazer” this doesn’t apply, so only a -1 for cover. He rolls a 4, so hits – a strength 4 hit against a defence of 5 needs 5+ to wound, and a 5 is rolled. The Professor spends one of his 3 luck tokens to force a re-roll, but as this is a 6, the wound still happens – the Professor is down to 2 wounds. The rifle-armed security guard takes aim and fires again, but rolls too low for even the Audience Appreciation tokens to bump it up. At this point, I should have used the 2 Appreciation tokens to activate another figure to shoot, as they disappear at the end of the turn, but forgot – one to remember next time. The RAF Man turns for 1 action and shoots the dog for the next. 4+ to hit, -1 for being small, but a 5 hits, then 2 wound rolls as the pistol is high-calibre @ 3+ kill the dog stone dead. The Professor and his Plucky Assistant move twice to get in to cover 6″ away from the Mad Scientist – they are still waiting for RAF Man to get into position to cover them, but he’s still messing about shooting dogs. Evil again wins priority with a difference of 1, so each side gets an Appreciation token (I think). Even with the dog dead, 5 models give 3 activations and the Mad Scientist, SMG security guard and dog-handler are activated. The dog-handler fire his pistol at RAF Man after aiming, but rolls a 1 and misses. The SMG can’t be aimed as it is a burst weapon, so 4+ at over half range and target in cover need a 6 to hit. 3 rolls to hit give one 5, which is amended to 6 with an Appreciation token. Strength 3 against the Professor needs a 6 to wound, and a 6 is rolled – the Professor can’t take another wound, so spends a luck token to force a re-roll and a 1 is rolled – no wound. The Mad Scientist figures out how to re-load the alien pistol and fire at the Professor, but misses. In the Good turn, the RAF Man finally makes the centre of the footbridge and fires at the Mad Scientist – it looks like a certain wound, but the Scientist’s forcefield (5+ save) deflects the shot at the last minute. The Plucky Assistant follows the Professor to within 2″ of the Mad Scientist and uses her Sleep Spray gadget card, but misses. The Professor and Plucky Assistant are very exposed if Evil wins priority. Luckily, Good wins priority by 2, so 1 Appreciation token each. The Professor runs into the Lab for 2 actions after activating his Plucky Assistant. She attempts to seduce the Mad Scientist, and succeeds after he fails his morale test of 4+ twice (the second time with a luck token re-roll). 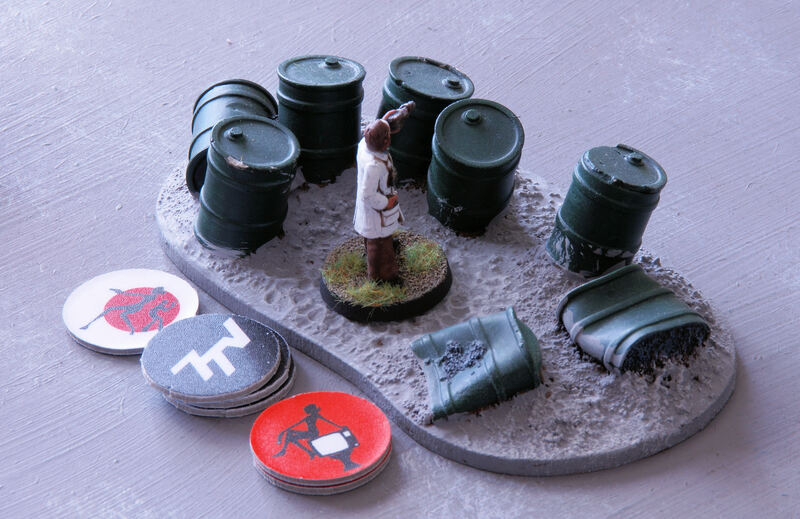 Plucky Assistant uses her 2nd action to charge over the oil drums at the confused Scientist (-1 defence) and rolls 5 to clear the obstacle. As this is make-or-break time, she declares a Heroic Attack to wound and an all-or-nothing attack to hit – this gives 2 dice to hit on anything but a 1 after modifiers, but if Mad Scientist is still standing after the attack, he gets to strike back immediately rather than waiting on his own activation. Anyway, 2 hits are scored, +1 strength for charging and +2 for Heroic Action means anything but a 1 to wound – again 2 wounds. The Mad Scientist uses his last luck token to force 1 re-roll as he has 2 wounds, but this predictably fails, and down he goes – well done Plucky Assistant! With the Professor in the lab and only a few inept guards standing in their way, it was obvious the Good side were going to win, so I called it a day there. 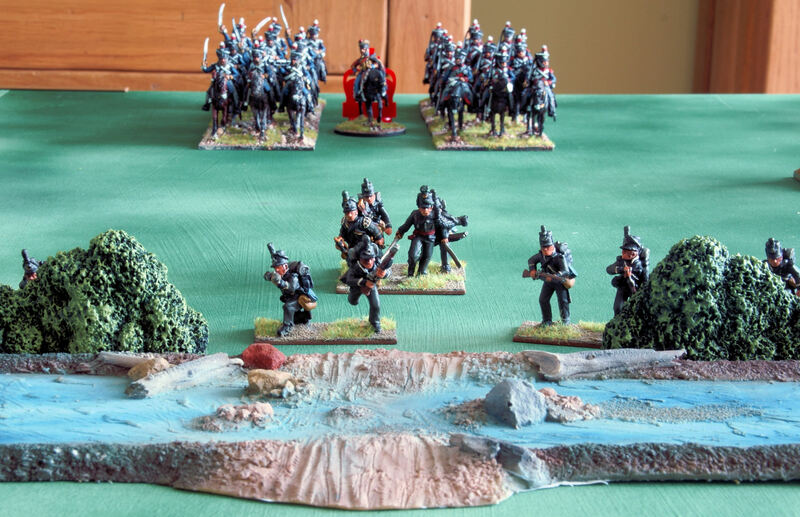 A try-out of yet another Napoleonic set – the holy grail of rules still eludes me, but I really want to like this set – I’ve tried them once before and thought they had potential. 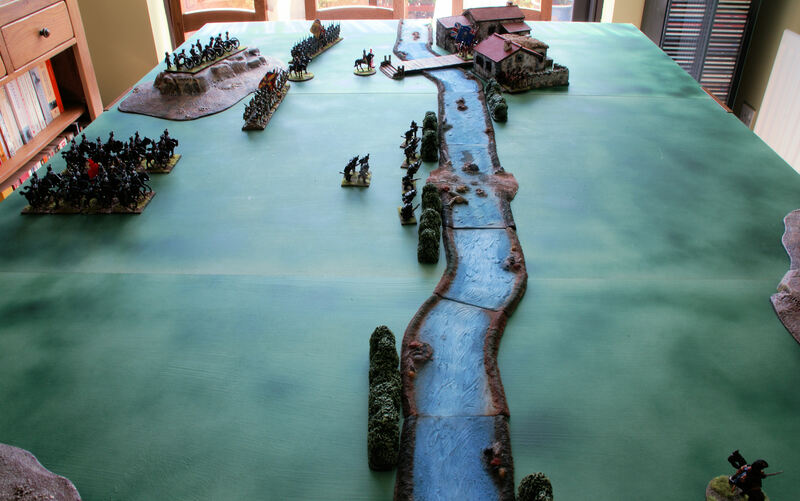 I decided to try something different from a stand-up fight for a change, so the British rearguard are holding a village which controls the bridge over a river – the French must take the village and control the bridge. A French cavalry brigade has found a ford somewhere downriver and will appear on the British side of the river at some point. This situation allows me to try out 2 aspects of the rules I haven’t tried before – fighting in built-up areas (FIBUA in the rules) and cavalry. I’m a bit worried by the 42″ (!) charge reach of light cavalry in these rules, but as they have to be on attack orders to charge, this may not be as bad as it appears at first glance. The French division consists of 2 brigades of 4 battalions of 36 men each and a cavalry brigade of 2 Hussar regiments of 12 men each – all brigadiers are average (seasoned in the rules), while the CinC is Skilful (+1 MP). The divisional 6pdrs are stuck down the road somewhere. The British rearguard is a brigade of infantry – a regiment of 30 Highlanders, a garrison for the village of 24 British Line (it is a type 2B complex under the rules, so this is the most figures if can hold as a garrison) and finally a unit of Portuguese line. They are supported by a cavalry brigade consisting of 2 regiments of 12 Light Dragoons led by a sluggish brigadier and also by a battery of Royal Horse Artillery. Both the British C-in-C and Infrantry Brigadier are average. The 95th cover the ford, supported by the cavalry brigade, as we wouldn’t want them damn Frenchies playing dirty and crossing at the ford! The first French brigade start on the table with Move orders, and roll 1 average dice to see how many manoeuvre points (MPs) they can use for brigade and single unit actions. They roll a 2 (doh!) and add +1 for the C-in-C’s skilful attribute, so 3. They pay 2 MP to maintain Move orders as a “seasoned” brigade, which leaves 1 MP. The Legere battalion really wants to deploy into half-batallion skirmish formation, but this takes 3 MP from march column, so they have to march past the riflemen at the ford and expose their flank. The brigade advances 16″ in march formation and that’s all it can do. The British are in position already, so don’t do anything with their MP. The artillery are at extreme range so conserve their ammunition (they only get 4 shots before having to retire to re-fit), but the rifles fire on the flank of the Legere, causing 2 casualties. 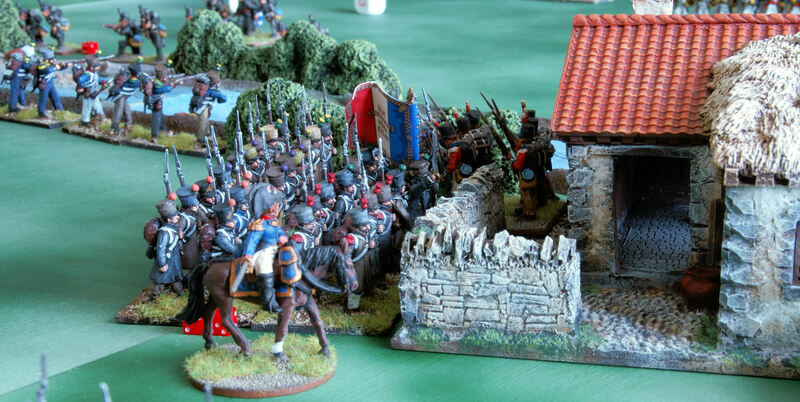 The 2nd French brigade arrives, giving them an extra dice to roll for MP – a 5 and a 4 gives 9, +1 for the C-in-C is 10 – that’s better! 2 MP for each brigade to maintain orders leaves 6. The brigade moves until a battalion is within 9″ of the village – at this point it must stop, as BUAs exert a zone of control which can’t be entered unless to assault the BUA. The French spend 3 MP to put the battalion closest to the village into attack column with their colonel at the front (a FORM single unit action) and also spend 3 MP to deploy half a battalion of Legere into skirmish formation to shield the flank of the brigade from the fire of the Rifles across the ford (I found out later I can’t deploy the Leger as skirmishers because the brigade is on Move orders – I should have formed line facing the Rifles to achieve the same result) . In the British turn, they fire artillery at the newly-formed attack column, starting off with 3 dice per gun, but getting plusses for enfiliade and being veteran to bring it up to 17 dice – only the fact that the column was a new target brought the dice down to 9 which only caused 3 hits. After the riflemen fired at the newly deployed Legere, the column had to take a resolve test for being hit by artillery, but passed. On turn 3 the French again won the initiative and rolled up 10 MP. It took 2 to keep the 2nd brigade on Move orders leaving 8. After 50% of the 2nd brigade moved slowly to fulfill their brigade order, 3 MP were then used to change the 1st brigade order to Attack to allow an assault on the village. The exploitation mechanic then allowed the brigade to activate again, so 2 MP to maintain Attack orders +1 MP as it was a first exploitation used 3 more MPs for a total of 8 used. One more MP allowed the attack column to be ordered to charge the garrison in the village. The column passed its resolve check to charge, and the defenders passed to stand. For their stand-and-fire check they rolled a 5, meaning it was going to be a point-blank volley. The column moved to 3″ where it received the volley from all 6 garrison bases (I think that’s right), which caused 5 casualties bringing total casualties to over 25%. Because it is an assault, there are different modifiers for resolve, and the colonel gave a +1 to cancel out the -1 for the casualties, so the resolve test was passed. Now for the close combat phase of the assault. It turned out that the French had 9 dice (7 combat groups of 4 men plus 2 for the colonel leading the assault) against the British 9 (6 combat groups of 4 men plus 3 for defending a class B building). The odds were with the British as a result of a difference of 0, 1 or 2 hits difference would result in a draw, with another round being fought immediately and the French being disordered as they hadn’t breached the defences, so halving their dice. However, the French didn’t see it that way, and rolled 7 hits of 4,5 or 6 out of their 9 dice against the British average roll of 4 hits. With a differential of 3, the French win the assault and breach the outer wall and lose 4 figures to the British 7 – the gallant colonel survives (didn’t roll a 6 on a leadership check) and the British pass their resolve check. On reading the rules, I think this means that the British can’t reinforce the building without a resolve check as they have lost the combat, so the remaining 17 figures might have to fend for themselves. Another game we have been promising to play for ages. Nick had taken Bastogne and killed 3 of my large units on turn 4, so it was going to be a draw at best for me, but more likely a marginal German victory as I had bugger all reinforcements coming on in turn 5. I should have stuck both airborne units in Bastogne to stop him taking it, but I was thinking more in the long-term, so used the 82nd to cover some VP areas which were actually out of his reach given the turn limit. As the Allies I didn’t use the special action to reinforce which I probably should have – also, we didn’t use the fuel rule for the Germans, so there were a lot more moves of 3+ areas and breakthrough move-attacks than perhaps there would have been with the limited fuel rule in play. (the Germans start off with 5 fuel assets, but every time a unit “strat moves” (typically to get from the rear areas to the front line) or an armour unit uses more than 3 MPs, then the fuel asset goes back into the draw mix, and may possibly not be drawn again). 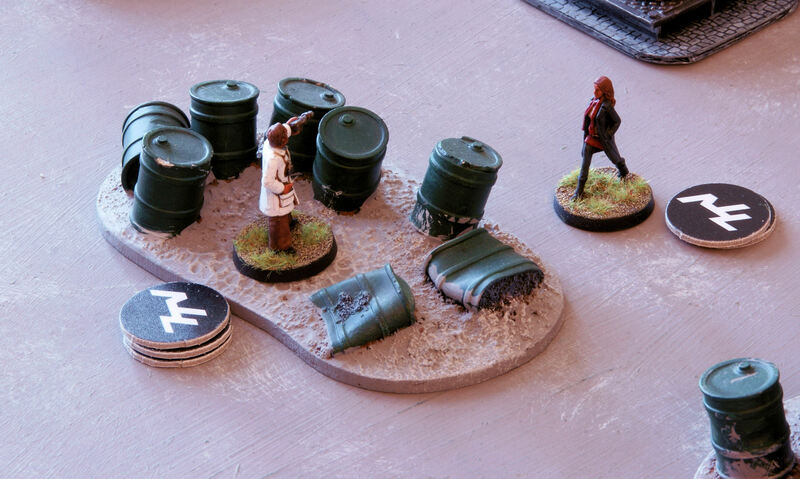 Terrain has a big effect on battles, being especially favourable for the defender. The blocks can also change quality through taking step-losses, so an elite unit taking a step-loss may become veteran, except that the order of combat is not determined by quality – green defenders still fire before elite attackers, but with a hefty minus to their dice-roll. Other things which were interesting were the random draw of assets such as artillery and reinforcements which then go back into the draw mix after you’ve used them. Artillery can be committed to important battles, but, of course, as the German, you never have enough of them, and they get less as the game goes on because you have to discard one artillery unit per turn. 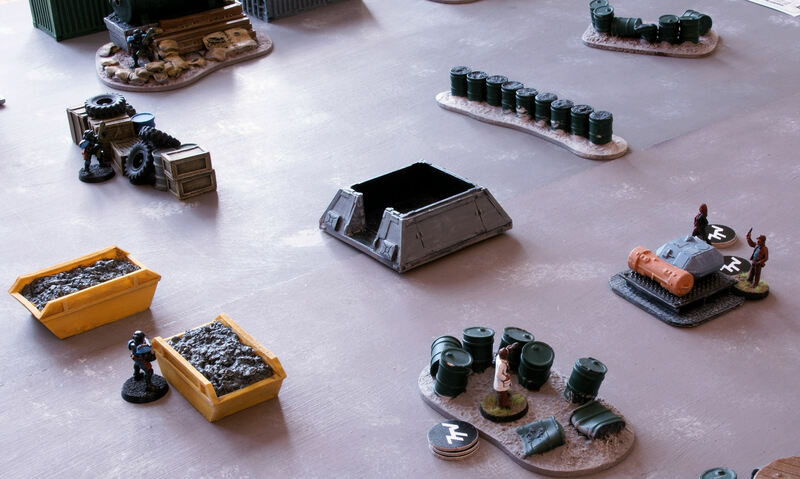 Events and special command actions are also in the draw mix and the Germans get to draw less as the game progresses, which realistically simulates them running out of ammo, troops and fuel, all in an easy to administer sytem. However, in the tournament scenario, they seemed to have assets enough, so it’s not such an issue in the scenarion we played. We played 4 turns of the 5 turn original tournament scenario in 4 hours and reached a conclusion. As the Allies, I didn’t get to put one attack in, so the scenario in C3i which starts mid-way through the game might be a better idea next time. As we are unlikely to be able to play a full game due to the usual time constraints, this looks like a better idea. We finally got around to a 3-player game of Here I Stand and it was well worth the wait. Nick was English/Protestant, Kevin was Papal/Hapsburg and I was France/Ottoman. As Nick and myself had played 2-player we were OK on the religious struggle, but not so hot on combat (no wars came up in our 2-player game) and not at all on New World stuff (not part of the 2-player game), so there was a bit of a learning curve. We started on turn 4 (1532) and agreed to play for 5 hours and finish the turn we were on then. On turn 1 the Pope surpisingly gave Henry VIII a divorce for only 1 card, but Henry was repused by Anne Boleyn. Luckily later in the turn Nick was able to play his home card to marry Jane Seymour and rolled a 6 to get a healthy Edward and 5 VPs – not such a bad start after all! The Ottoman (me) went straight for Vienna, and rolled really well to eliminate the Hapsburg defenders and capture their leader Ferdinand (he was never ransomed and rotted in an Ottoman prison for the rest of the game). The Ottoman was slowed down by the English giving them a foreign war in Egypt to surpress (which I didn’t manage until halfway through the next turn). The French built a Chateau and being at war with no-one, set off for the New World and recruited with their cards. The Pope and Protestants were embroiled in a religious struggle which gave me a window to make some lunch for everyone and get a VP for Piracy (the only one in the entire game). The turn ended with the Ottomans on 19, only 2 points ahead of the Hapsburgs, but making them an obvious target for the other powers on the next turn. And so it came to pass in Ottoman Vienna – a play of Unsanitary Conditions reduced the mighty army then a surprise attack card caught them outside the walls, wiped them out before they could defend themselves and captured Suleiman. The response was pretty feeble – I set up a Pirate Haven in Tripoli with some Corsairs in the hope of gaining more VPs through piracy, but I hoped in vain. England had declared war on Scotland at the beginning of the turn hoping for an easy key in Edinburgh, but I as the French played the Auld Alliance card to send reinforcements to Edinburgh – this enabled the Scots to repulse 4 separate assaults over the next 2 turns and hold on to the key for France. Although I would much rather have fought the Hapsburgs, Nick gave me no choice as the loss of Edinburgh would have cost me 2 VPS, so we spent CPs fighting each other and achieving little. The Hapsburgs finished turn 5 on 21 VPs, 4 ahead of France, Ottomans and the Protestants on 17, with the Pope on 16 and the English on 14. This made the Hapsburg the man to chase, so France declared war on them, hoping to take Antwerp off of them. Kevin (as Charles) took the opportunity to invade France from the south, and I spent the turn fighting him off at Marseilles, with the aid of the Lansknechts card and a relief force from Lyon – I never did get to attack Antwerp, but at least I captured the Duke of Alba. My Ottomans recaptured Vienna along with Charles while the Hapsburgs were distracted in France, though Kevin had a Ransom card to play next impulse to get him back (Kevin’s Hapsburgs had cards coming out of their ears this turn, having won 2 cards from New World resources!). At some point in this turn, the religious struggle really took off with Nick having to play the Council of Trent mandatory card, and the Papal and Protestant lined up to do battle. Out of 10 dice, the Pope scored 9 hits whereas the Protestants could only manage 1 hit (were they at the communion wine or something? ), so 8 (EIGHT!) spaces switched back to Catholicism – the Pope shot up to 24 VPs, and more St Peter’s building put him to 26 at one point, but some more reformation attempts by the Protestants and English pulled him back to 22 by the game end, though it was still enough to win as we were out of time. Final scores were Papacy 22, Hapsburg 20, Ottoman 19, British & French 17 and Protestant 15. It took us from just over 5 hours to play 3 turns, so this sort of thing isn’t going to be happening too often, and I don’t have anywhere to leave games set up over sessions. It was exciting right up to the last card plays with both Nick and myself trying frantically to peg back the Pope after the Council of Trent debacle. A good sign is that plans are now afoot to get a 6-player Vassal game together by roping in some other friends from around the country – report to follow in about 2-3 years….